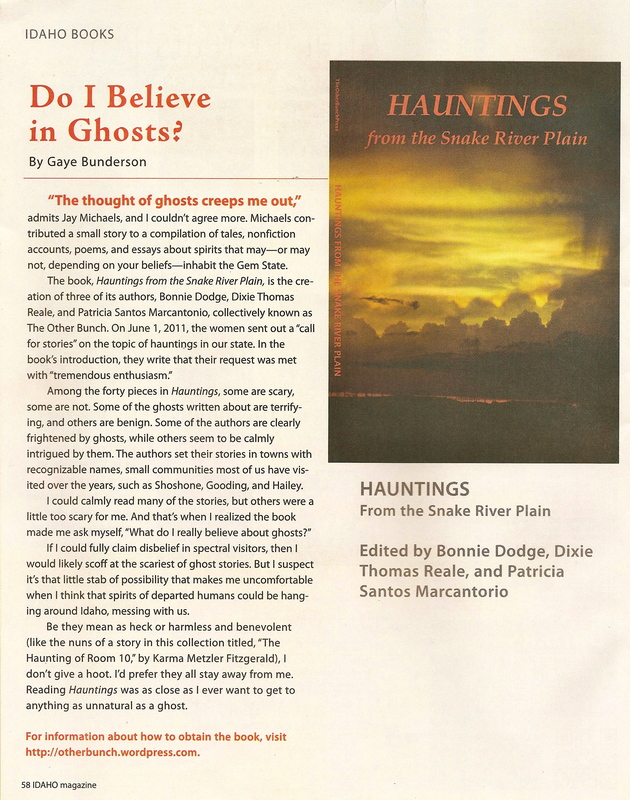 Check out Gaye Bunderson’s review of Hauntings from the Snake River Plain in the November 12, 2012 issue of Idaho Magazine. Thanks Kitty Delorey Fleischman, publisher and editor of Idaho Magazine, and writer Gaye Bunderson. This discussion was started last month by Patricia Santos-Marcantonio concerning publishing one’s writing. I want to continue the topic. You’ve written an exciting story, chose the perfect words to tell the tale, polished the manuscript until it shines, now you need a publisher. There are several avenues available if you have a book-length manuscript. 1. You can locate an agent and have the agent sell your writing to a publisher and help market the book for you. Finding a good agent can be as difficult as finding a good publisher. Start your agent search at writers’ retreats, writing seminars, or ask other writers you know for recommendations. Agents can be found on-line, in writing magazines, writer’s market books and publications as well as word of mouth. Just remember — there are a lot of dishonest people out there wanting to separate you from your money. If a potential agent asks for money up front before he does anything for you, keep looking. 2. You can mail your manuscript to potential publishers yourself. Get a good writer’s market book or go online for potential markets and look the listings over thoroughly, match your subject matter and writing style to the proper market and send the manuscript to the current editor. Expect that it is going to take a long time to find a home for your manuscript. You will send hundreds of copies to hundreds of potential markets before one will show interest. And several will show interest before one will finally commit to publishing your story. Keep many copies of the manuscript moving at all times. I like to keep at least two dozen (24) copies of a book-length manuscript circulating. When one copy comes back in the mail I send it out to another potential publisher. Don’t worry about “what if one publisher accepts it while it is also being offered to another at the same time.” We should all be so lucky. If that happens, drop a polite letter to all the places where the manuscript has been sent and not yet accepted or rejected and inform them that the manuscript is no longer available. Even with return postage some publishing houses do not bother to tell you that they do not want your manuscript, they just toss it in the garbage. Keep a record or log of where and when you sent the manuscript and when it was rejected or interest shown, what sort of interest was shown and what you did about the interest shown. Also note any comments the publisher may have made along with the rejection slip. 3. You can publish your manuscript on-line. Google “on-line publishing” and some 56,000,000 sites are listed. Online publishing sites like http://www.authorhouse.com, http://www.xlibris.com, and http://www.infinitypublishing.com to name a few charge the author a set up fee for setting up the manuscript, proofreading and editing the text and for entering the copy into their publishing files. They will work with the author to create a book cover if needed. Customers then buy books from the web site and the author gets a royalty for each book sold. The author can usually buy books at bulk or wholesale rates so he/she may have copies available for sale to friends, at art and craft shows or at trade shows. Book stores, libraries, book clubs, etc. can also order books from the web site and retail customers can request a local book store order a copy of the book for him/her. Another type of on-line publisher allows the author to set up the manuscript on-line using the publisher’s tools and if the author’s editing and proofreading is perfect he will then have a letter perfect book available for others to purchase on-line. http://www.lulu.com is an example of this type of on-line publisher. The ultimate customer pays the printing costs of the book when he orders it. The books are available to the author, customers, bookstores, libraries etc. through this type web site. Then there is the type web sites where manuscripts are published and read wholly on-line. Many magazines have printed copy and separate on-line versions. 4. You can self publish your book. Self publishing no longer has the bad reputation it once had. Lots of authors self publish and sell a lot of books. Some authors in an effort to avoid the self published stigma create a publishing company, name it something different than their own name, and publish and sell books that they write. If they find it a successful enough venture they might even publish books written by other author friends and branch out from there. Remember the biggest publishing company in the world started with a first book at some time in the past. If you decide to publish your own book you will have to locate a printer, get your own ISBN number and file your own copyright forms. But then you do not have to share profits with anybody else, they are all yours. 5. If you publish your book overseas with a foreign publishing house, you will find the results of this arrangement are mixed and there is the potential for many problems. Publishers overseas are a long ways away so it is impossible to know if they are trying to sell your books or not and authors often complain about never seeing royalties from sales of the book with foreign publishing houses. There is the problem of distribution rights, and the cost of shipping books to the United states from a foreign country can make the eventual retail price of the books prohibitive. 6. If you have a shorter manuscript: feature story, fiction, travelogue, tale of adventure, or whatever look to regional publications. Smaller newspapers, magazines or other local publications are always looking for local interest stories to fill their pages and many buy from freelance writers. Try places like your local weekly or daily newspaper, regional monthly or bimonthly publications or talk to local authors you may know. 7. You can also create your own web site and blog like we did right here on http://www.otherbunch.wordpress.com. You are free to write and publish whatever you wish on your own web site. Good luck in finding a happy home for your words. From its beginnings as a railhead for farmers and ranchers, Shoshone was a bustling, thriving community on the rise. Like so many other towns, however, when the railroad stopped passenger service, it had to reinvent itself. Shoshone has kept its sense of community while it starts to grow anew. 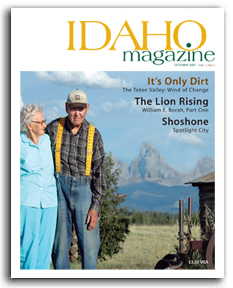 Read the complete article written by Dixie Thomas Reale in the October 2007 issue of Idaho Magazine.